People haven’t always been good to whales and dolphins. We’ve polluted their ocean home, hunted some species to the edge of extinction, and confined them in tanks for our entertainment. That’s why the time has come to show our #love4whales. Help us to work with communities around the world who love whales and dolphins, respect them as wild animals, and want to protect them and their habitats. Whale Heritage Sites from Alex Finn on Vimeo. Many of these places are in the developing world, where under-resourced communities are battling developers, mineral extraction companies, industrial-scale fisheries, and irresponsible tourism businesses, all to protect their whales. Through our Whale Heritage Sites initiative, we can work with people in the many places where coastal communities are trying to protect their whales and dolphins. With your help we can also encourage more places to celebrate cetaceans and marine biodiversity through cultural activities represented by the arts, music, science, education and events. Finally, we can develop responsible tourism and sustainable practices that will benefit people and nature for future generations. Help the world with a little bit of #love4whales. Share your #love4whales by posting images of people helping whales and dolphins around the world. 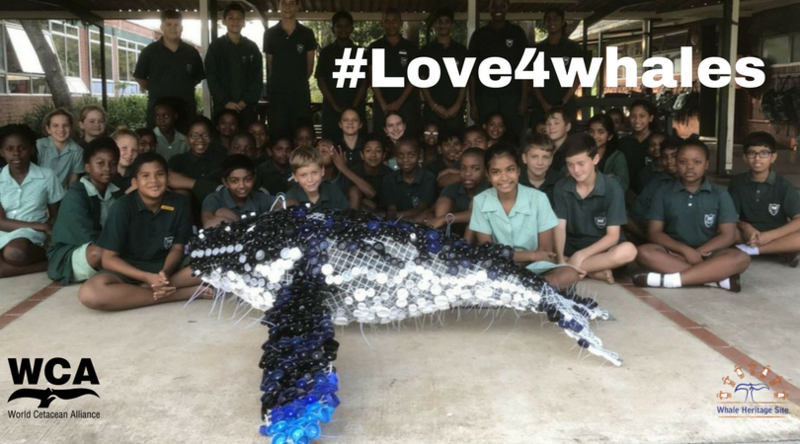 Share your pictures of people watching whales, talking about whales, making whale crafts, and celebrating whales, with a link back to the chuffed donation webpage https://chuffed.org/project/love4whales. Instead of a simple donation why not enjoy one of the exciting perks generously donated by the World Cetacean Alliance’s Partners. From a weekend away to the Isle of Wight, whale watching adventures in the Azores or South Africa to a swim with encounter in Mozambique, donate to enjoy one of our exciting oppportunities. Have you always wanted to adopt a whale…well now’s your chance. Thanks to the World Cetacean Alliance’s partnership with Happywhale you have the opportunity to adopt a whale for a year. Discover a full list of these exciting perks and more in the perk list on the chuffed project page.